We would not understand the music as we do if we had not drunk from the sources of the great masters. 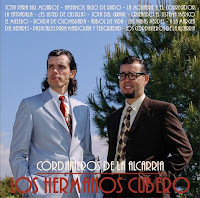 The result of this album is like the basin of a source of two pipes; these pipes that feed the basin and mixed into it are bluegrass music and traditional music of Castilla, and as its main exponents we consider to Bill Monroe and Agapito Marazuela. At the same time others drank from these sources before us and inspired us. How could we not mention the Stanley Brothers and Jimmy Martin on one side, and Nuevo Mester de Juglaría or La Musgaña on the other. Of course, we also have been guided by other musicians, La Ronda del Alamin, Merle Haggard, or La Ronda de Boltaña, just to name a few. To all of them also our sincere thanks. The BB today also features the new banjo instruction book by Lluís Gómez and Toni Giménez (see the EBB for 1 November) and news of the Barcelona Bluegrass Band.